Dr. Chuck believes all pets deserve to be happy and healthy - When in doubt, Call your vet! Pet owners and Future Pet Owners Click Here! Pet information sheets, resources for pet owners, and more! Check out Dr. Chuck's Picture Books! Picture books for kids about animals and the vet! 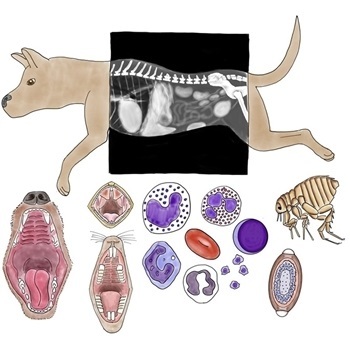 Learn about all the many many parts of veterinary medicine! More coming soon! Click Here for fun Veterinary-themed activities! Games, Crafts, Coloring Sheets, Word Searches, and more! Click Here for Teacher Resources! Free printable worksheets and classroom activities! Help students learn about animals and the veterinarian! Click Here for Dr. Chuck's Free Pop Up Veterinary Clinic Playset! Pop Up Veterinary Clinic Playset! Free Printable Pop Up Veterinary Clinic Playset! Print, Color, Play! Learn more about Dr. Chuck! Read more about Dr. Chuck's mission!